Detail. – Dirty wet dog , boats and sailing. Well i’ve been getting on with sorting out WABI”’ rig ready for the delivery trip back to the Tamar. While i have been talking about changing the rig completely i have also been first trying to make this one work better and a simpler/cheaper option of just sorting out the hardwear. Once again the problem with the Liberty is that stick all the way at the front of the boat and basically getting there with the boom swinging around. From left to right that’s the port lazy-jack, ist reef tack and clew downhauls, red line is the main halyard, next red (new) line is the vang and the orange line is the mainsheet….all where i want them at the aft edge of the cabin roof. What i also did was run everything through turning blocks or fairlead eyes so that all the lines are held near to the grabrail and aren’t running all over the deck. Lines rolling under my feet are one thing i really dislike and clearing the coachroof has been a big part of this project. I have got rid of the winch that i used for tensioning the halyard, the new position is much easier to haul from but i might need to double the halyard so that i get a 2:1 purchase especially if i get better sails and a hard halyard rather then the original knicker elastic. Also in picture is the new mainsheet arrangement which now doesn’t have the sheet going all over the cabin roof before going to it’s brand new jammer and below is the new vang made from a 3:1 tackle pulling on a whip. My method of attaching some of the turning blocks isn’t perfect as it relies on eye-nuts turned onto the ends of the stainless steel stud that forms the mast pivot….i did also move most of the blocks, pad-eyes and so on near the base of the mast so that lines run a lot more cleanly and i can open the hatch while sailing if i want to. Mast-base port is a little busy but it does all seem to run and nothing is obviously chafing badly at this stage. The second reef lines will go to stbd….don’t often get used. So far my effort has all been around the mainsail and it’s systems because they are the awkward ones to get at underway. Next job will be to set up the gear for a second reef, i normally only rig that if things start looking a bit brisk but it would be better to have a permanent ready set-up for that as well. The mizzen will obviously be the next job, being right in the cockpit i have never worried about it but it could do with a good sort out too. One thing that has always been a literal pain is the mizzen boom which is right where my shoulder and head want to be, it also makes it very difficult to get a cover over the hatch and cockpit. What i am playing around with is the idea of building a simple wishbone and using that instead of a conventional boom. The wishbone inboard end would then be a lot higher than the existing gooseneck and it would be the work of seconds to heave the whole deal up on lazyjacks and get it all above head height while at anchor. There is one wishbone rigged Freedom (30 ?) in the yard so i i had a neb at that to see if i could work out the rigging arrangement for a wishbone….must say i’m not sure how his one works. I think mine would need something like a ‘snotter’ arrangement as my sail runs in a track and i have clearly got to hold the wishbone against the foot tension of the sail. Got a little research to do there ! The bigger job with the rigs has to wait until i get WABI”’ back to base at which time i need to take both masts out and have a good look at them. 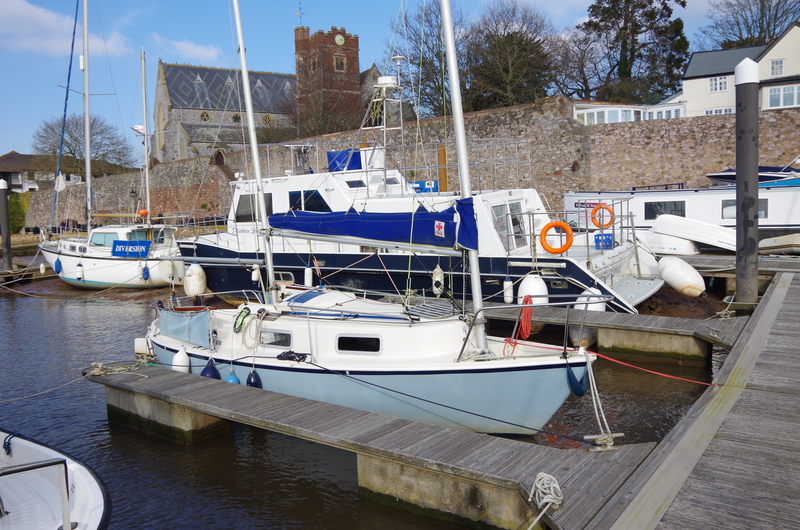 The foremast will need some work at the truck to allow for a 2:1 halyard arrangement and the Liberty foremast is prone to corrosion at it’s base as it sits in a free-flooding well. The foot is held in place by a bolt that goes through a compression tube and that area can ‘rot’. If mine is a problem, and the boat has been sailed a lot harder by us, then what i might do is take the bottom few inches off and add a wooden plug at the bottom and have the bolt going through that. That would then lower the height at the goosenck which i think would be beneficial. At the tip i might even lose a few inches to a new crane and sheave. While i am thinking about alternative rigs i know that one Liberty has just been improved with better and larger fully battened sails, the rig isn’t stiff enough for a square-top but equally a slightly fatter head even with a shorter luff would be a lot more areodynamic than the ‘thin’ triangle the head currently is. This is ‘FOAM’ for example which has gone down that route….not sure about the IOR style droopy booms but the sails look better than my skinny ones. Currently the total rig change isn’t a viable option because the budget for materials, even freestanding wooden ones, has been totally used up in servicing, MOT-ing and sorting stuff on the truck ! Similar to last time it was really, really cold down there at night and this time there was a bitingly cold northerly breeze running straight down the river and clear bright blue skies except for cold hard showers…..had me running inside and shutting everything down a few times. Working at a distance from home has been interesting because i have only used the toolkit aboard the boat and mainly fittings and fastenings from the bits box. I did take an order of new stuff with me but not much beside that. Luckily the yard has a little chandlery that sorted me out with the few fasteners that i didn’t have onboard. What was a failure was the little battery drill i bought for the boat. Of course it was flat when i went to use it and of course i didn’t have the charger. Just on the off-chance i went up to the little hardwear store in the town to see if they had an old-style hand-drill. They didn’t but suggested that the ‘Antiques’ store ( read ‘junk) on the quay might sell some secondhand tools…..and hey presto a hand-drill and a good quality hand brace for £20 the pair !. The hand drill and especially the brace are now my favourite ‘away’ tools as the battery never goes flat. The brace especially is a lot more ‘powerful’ with me turning it and more controllable. There are a couple of gaps in my boat tools set-up and i could do with a stock-up on the common fasteners but everything said it was a neat little ‘away’ refit. Hoisting the main is now quite easy again as i find that i can get a decent enough heave on the halyard and when i need to put the first reef in i can preset the halyard during the drop and heave the luff tight using the reef tack-line as a downhaul. I did make a serious mistake in not rigging the second reef for my spring delivery trip and that meant effectively having to lose the mains’l completely when i really could have done with the sailpower forward. Hauling the mains’l down completely is also easier without the additional friction from the ‘winch from hell’. Going forward is still a serious problem in a blow as i had to do during the Lyme bay trip and that highlights the need to keep sorting all this stuff. By now i will have posted what actually happened during my attempted delivery trip. I had only set up the first mains’l reef and the one mizzen reef and they came in easily. What happened though is that i really could have used that second reef, as it was, going forward and getting the mains’l down in the conditions i had felt like a horribly dangerous exercise. The guardrails didn’t help me one little bit and of course with that much wind the sail wouldn’t just self-drop and secondly the stack-pack still made a huge amount of wind resistance as i hove-to. I really, really don’t like the stack-pack idea and if i could do canvas work myself i would just ditch the whole idea and have conventional sail bags and topping lifts. Previous Really for sale now.